(SPOT.ph) The Brits probably did it best-Sunday roast as an English tradition dates back to the 18th Century, a hearty lunch after church with Yorkshire pudding and earthy potatoes served among laborers, then the leftovers were eaten for the rest of the work week. There have been many interpretations of the dish since then, and we Filipinos have come to recognize this as a special treat over the holidays or at an indulgent hotel buffet. There’s a particular dry-heat method that results in top-quality roast beef, one that depends on cooking time in the oven as well as the period it takes for the meat to rest. Then there are all the other elements: herbs, potatoes, vegetables, et cetera. Each restaurant would have its own cut of choice, but whether its the belly, rib, brisket, topside, what matters is their successful execution. In our search for the best ones in Manila, we looked for overall tenderness, flavor, and presentation-the meatiest and most original ones have come out on top. 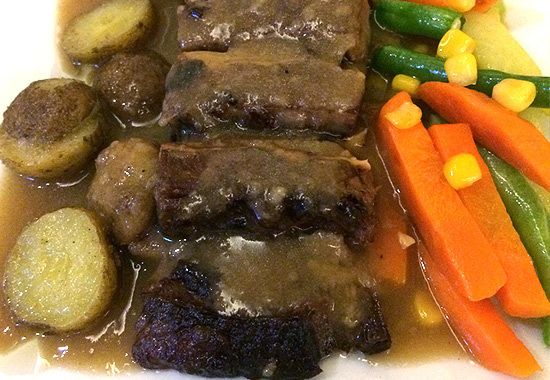 Testing only individually portioned, plated roast beef dishes, here are the best in Manila. A satisfying roast beef meal for just a little under P200 (and a bit over if you want more sides) is a good find, and Rodrigo's is the place to have it. With a small countertop kitchen and just a few small tables, it's hard to imagine it as anything offering much, and yet the roast beef at this place is flavorful, hinting at a bit of herbs and fragrant spices. 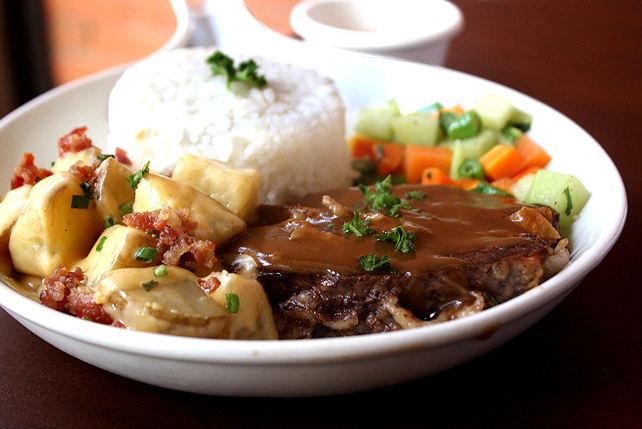 You might even find yourself relishing the gravy multiple times for a better dose of those meaty flavors. The carving station is right by the entrance so you can immediately spot the source of that unmistakable whiff of beef drippings and charred goodness. 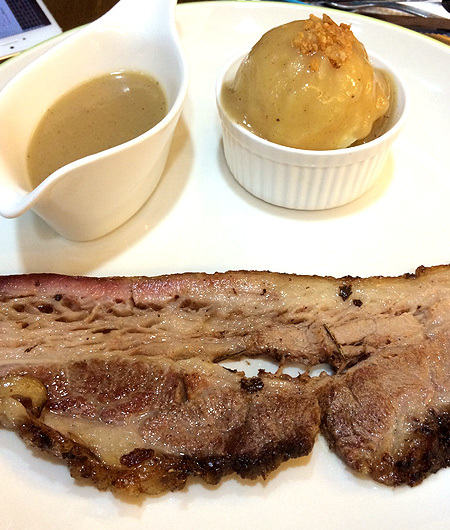 Rodrigo's Roast Beef is at 21 Aguirre Avenue, BF Homes, Paranaque City (0917-403-7008). The dish arrives on your plate with a hefty serving of meat (two slices could easily be shared by two, even more)-long and meaty strips with laces of fat here and there, which have those roasted edges that can be a bit chewy at first, but contributes good texture nonetheless. The gravy is already poured over so the quality of the meat on its own can be a hit or miss, but it's a hearty meal with enough familiar flavors to fill you up for a while. Don’t neglect the side of mashed potatotes-it’s as good (if not better!) as how you make them at home. 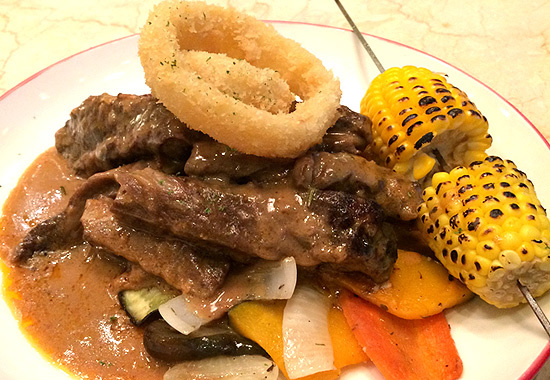 Relish Hello Happiness is at 74 Scout Limbaga Street, Near Tomas Morato, Laging Handa, Quezon City (352-5492). We've raved about it before, so it was natural to go back to one of our favorites. 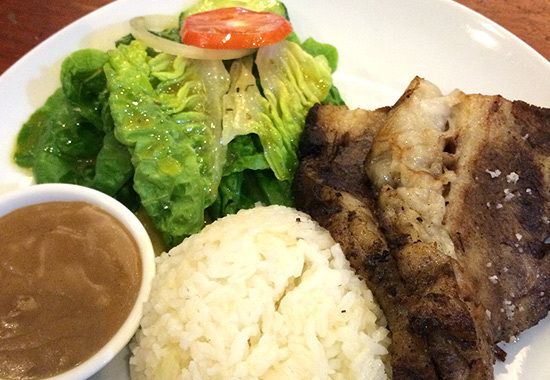 From its original home at Kulinarya in Power Plant Mall, this dish makes its way in a more casual setting at KXP, where the flavors are homey and the servings generous-all for a good price. The meat has just the right amount of fat to keep it tender, while the side of potatoes could easily remind you of how melted cheese over anything is always better. 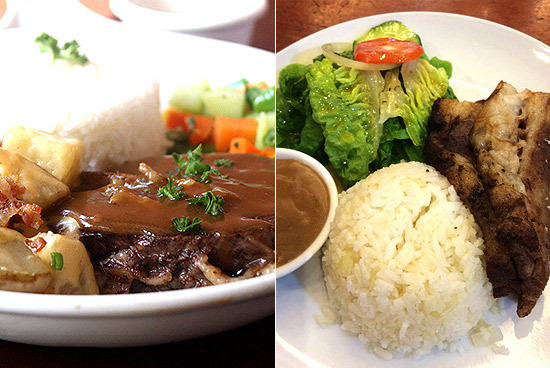 You can also enjoy this house specialty in two other ways: in a baguette (P250) or with macaroni and cheese (P350). KXP Kulinarya Experience is at G/F Commercenter, Filinvest City, Alabang, Muntinlupa City (843-4503); and G/F Tower 1, Rockwell Business Centre, Ugong, Pasig City (567-2562). Finding something on the menu that's dubbed as "the most awesome" could cause problems (what if it's not? ), but H Cuisine is a popular choice for good reason. The meat is pleasantly tender, with that delicious seared flavor complementing the buttery goodness coming from the side of vegetables and potatoes. The server places it atop a metal (stand) followed by a small tea light candle underneath, but we're not sure if this really helps to keep the dish warm all throughout. 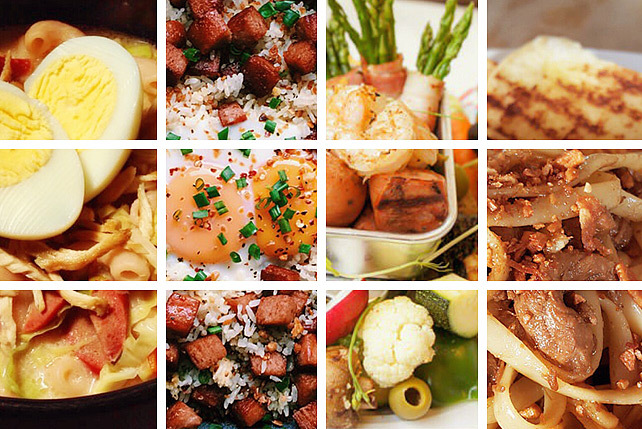 H Cuisine is at 7427-B Yakal Street, San Antonio, Makati City (887-2370); and 64 Scout Rallos Street corner Tomas Morato, Quezon City (413-0347). When you see the plate of glistening, charred beef in front of you (with a sprinkling of salt on top), you have to wonder whether Dome is doing you kindness or a disservice. But we suggest not thinking about the trim of fat too much. Biting into this almost meltingly good portion of meat offers a no-frills thrill to your roast beef experience. Focus on the meat, which is scorched with punches of flavor even without the gravy. The buttered rice on the side doubles this plate’s exceptional sinfulness (you can try to cut it with some salad), but take comfort in knowing that there's plenty on your plate for sharing, so you don't end up feeling guilty. Dome Cafe is at G/F 1880 Building, Eastwood Cyberpark, Libis, Quezon City. The packed flavors in this roast beef are apparent through and through-and that melt-in-your-mouth quality of the meat (which is exactly what it says on the menu) is hard to miss. 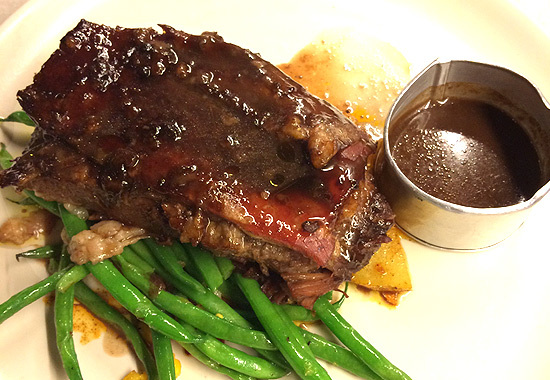 It's that smoky taste that also adds to the memorable experience of eating your way through. 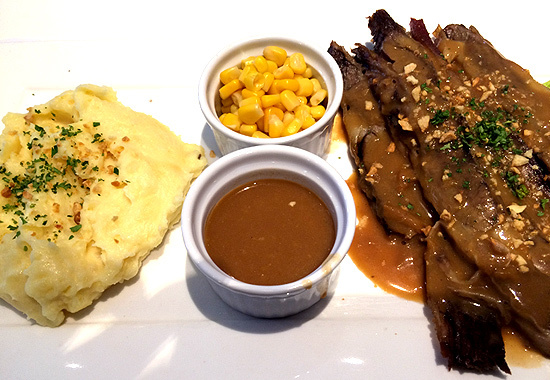 The gravy hints at those charred elements, made even more delectable with each bite of the brisket slices, paired with a dollop of creamy roast garlic potato mash. The hefty strip of fat that comes with every serving may make even health nuts go weak at the knees for this delectable sight. 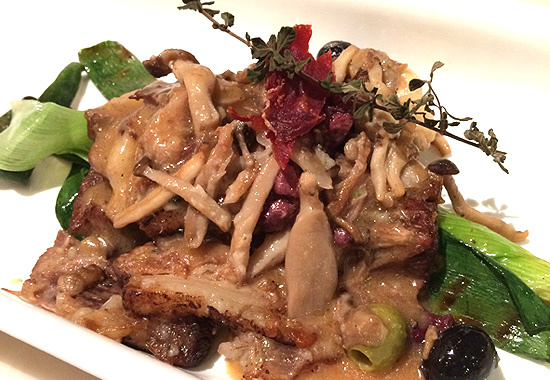 Duck and Buvette is at 2/F Main Wing, Shangri-La Plaza, Mandaluyong City (631-0675). It's a modern interpretation of your traditional Sunday roast: the rib meat perfectly tender with roasted vegetables and corn cob on the side, but the gravy offers a hint of curry. Then there are crisp onion rings on top to add another level of texture, as well as some "smashed potatoes" hiding underneath the beef strips. The tenderness is slightly bumpy throughout, but we love its bravado for introducing exciting flavors into a traditional dish. 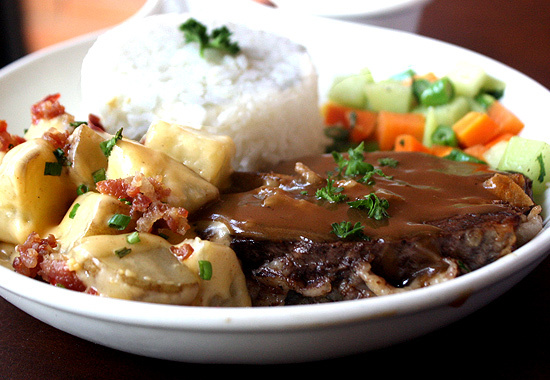 MoMo Cafe is at G/F Eastwood Mall, Libis, Quezon City (900-1006, 900-1007). If your meal has been cooking for about the same amount of time you'd be on the plane from Manila to New Delhi, then you're already off to a good start. 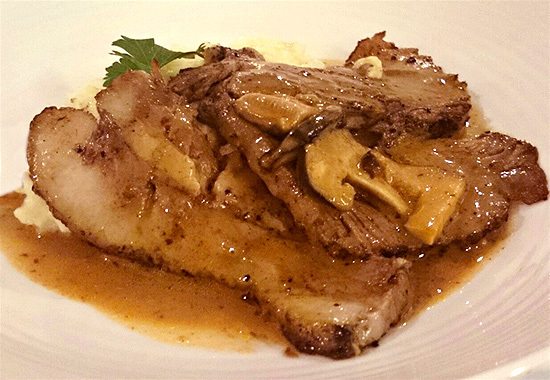 The Angus beef belly at Bizu features fork-tender meat with only a few layers of fat (you’ll hardly feel you're eating something heavy), but still so, so juicy and succulent. The meat itself is peppered with herbs, flaunting a nice amount of saltiness and savoriness. Everything else on the plate-potato gratin, grilled vegetables, mushroom gravy, and a side of horseradish-all serve to complement the beef, so you're bound to come back for it again and again. The thick cut of meat and caramelized skin should be enough of a draw, then slowly work your way through the layers of this beef belly and it rewards with such tenderness and flavor. The sweet, roasted addition of muscovado sugar seeps with every bite, down to the bed of potato slices and crisp green beans on which the meat rests. The sweet-salty dripping sauce adds another dimension should you need an extra kick of fat, although the flavors stand on their own even without its help. Grace Park is at G/F One Rockwell, Rockwell Drive, Rockwell Center, Makati City (843-7275). At first glance, it’s easy to assume that the beef would be overshadowed by all those components-the truffled cabernet gravy, roasted mushrooms, olives, et cetera-but the result leaves a distinct impression, and a memorable one at that. The meat is not overwhelmingly fatty, nor that hint of truffle which characterizes each bite with just the right balance of tang and kick. The knife will just be sitting there right by your plate, since there's no need to pick it up to slice through meat that's already so perfectly tender, just as it should always be. 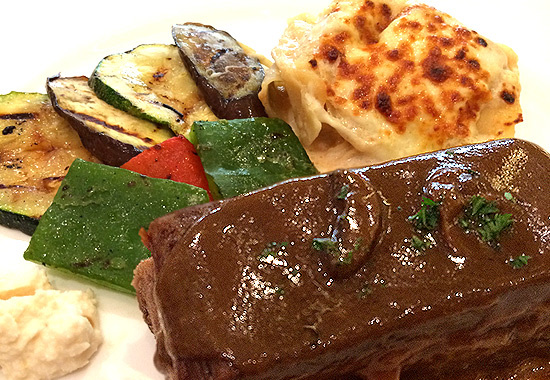 Stella Wood Fired Bistro is at G/F Bonifacio High Street Central, Bonifacio Global City (621-3222).